The visit of the Indian PM to UAE after an interval of 34 years marks a beginning of renewed engagement with the region, coming at a time when the whole region is undergoing metamorphic geopolitical and strategic change. The visit signifies the active foreign policy adopted by the current dispensation in India. 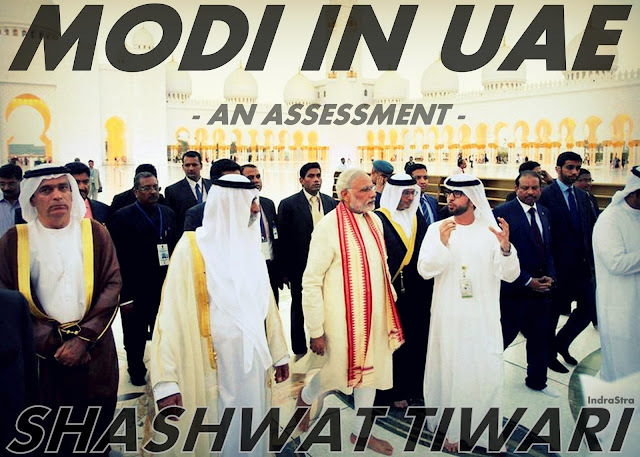 Further, UAE visit also symbolizes the larger strategic objective of Indian foreign policy i.e. to engage with governments on all fronts where national security stakes of India are directly or indirectly involved. The visit has been highly successful in its outcome; this can be ascertained from the language of the Joint Statement issued by both the governments. The Joint Statement clearly demonstrates foreign policy recalibration on part of UAE, with respect to its Pakistan policy. At the start of this highly anticipated visit the objectives laid out by the Indian side was to push for better trade and investment relationship as well as to court UAE support to fight international terrorism and other trans-national crimes. It appears that the Indian side has been able to achieve what it set out to do in the first place. The Joint Statement encompasses various agreements ranging from economics, defence, security, law enforcement, cultural, and consular services to realize the full scope of the India-UAE relationship. The bilateral relationship has been upgraded to a comprehensive strategic partnership level, which symbolizes the importance of UAE for India and role UAE can play in its wider West Asia policy. At a time, when bilateral ties bound by historical and cultural affinity needed to be refurbished to reflect the current geopolitical and geostrategic realities, India seems to have played a masterstroke by warming up to the UAE. The substance of the joint statement issued by India and UAE has managed to re-define the contours of a relationship that had long been languishing on account of political ineptitude and lack of strategic foresight. In a remarkable resolution, both countries denounced and opposed terrorism in "all forms and manifestations, wherever committed and by whomever, calling on all states to reject and abandon the use of terrorism against other countries, dismantle terrorism infrastructures where they exist, and bring perpetrators of terrorism to justice." UAE has historically been closely tied to Pakistan on the strategic front. However, the consensus on dealing with the scourge of terrorism by both countries, shows how well the Indian leadership has read the changing strategic realities in the West Asia and has managed to court it to their strategic advantage. This is a real diplomatic triumph and the UAE endorsing India's concerns on terrorism and extremism underscores the challenges facing the Gulf kingdoms at a time when the Islamic State is rising and sectarian divide in the region is widening. Often India's policy towards West Asia is viewed through the prism of India-Iran relations. The international community has always raised flags over India’s engagement with Iran and support to her during the sanction period, while missing India's simultaneous engagement with Arab Gulf states and Israel. Off late, India's engagements with the Arab states in the West Asia has gained momentum, even as Iran continues to be center of global attention. According to the Joint statement, Trade and investment will also get an impetus after PM Modi's visit. The UAE's decision to step up its investment in India including through the establishment of UAE-India Infrastructure Investment Fund, with the aim of reaching a target of US $ 75 billion does not only bode well for the Indian government but also for many foreign investors who are looking at India as the crown jewel in Asia, in the aftermath of the Chinese stock market crisis. The UAE will also be helping Indian companies to invest in infrastructure development in the Gulf country and will be tapping into India's expertise in small and medium enterprises. One of the driving forces for India-UAE ties has been the energy sector. The GCC countries supply 45 per cent of India's petroleum; the Saudi Arabia is responsible for a quarter of those supplies, and Kuwait, Oman, and the UAE are other major suppliers. Qatar remains India's exclusive supplier of natural gas, annually supplying five million tons of LNG to India. The Iranian government's decision to renege on some oil supply commitments, after India's vote against Iran at the IAEA, has also impelled New Delhi to diversify suppliers. Developments within West Asia will have a great bearing on the future of India's relations with the region and her stature in global forum. Till now, it appeared that the Indian foreign policy for the region was favoring the status quo considering regional stability is essential for Indian interests in the region. However, the Prime Minister’s decision to establish deeper ties with UAE appears to be the precursor to a policy shift on West Asia. Nevertheless, further foray into the region will be a delicate balancing act due to several competing interests extant in the West Asia. For example, the rivalry between Saudi Arabia and Iran for regional leadership is likely to intensify along sectarian lines in the coming years. Further, the Israel-Iran rivalry, in the aftermath of the nuclear deal will in all likelihood witness intense efforts on Israel’s part to maintain the status quo as far as the power dynamics in the region are concerned. Given India's growing stakes in the Gulf, it will be compelled to adopt a more nuanced policy to maneuver such competing interest, whilst reasserting her role as a great and responsible power and extracting adequate strategic and economic leverage at the same time. PM Modi's visit to the UAE has emphasized India's continuing stakes in a region that is going through a period of significant yet unpredictable change. It would be in the interest of India to maintain a stable balance of power to emerge in a region rife with multiple fault-lines as it makes further inroads into the West Asian region. On a positive note, a region, which was long ignored by India for ill-conceived reasons has finally found utterance in the Indian strategic and diplomatic sphere on account of Prime Minister Modi’s successful visit. The author is the Strategic Affairs Researcher at the Oval Observer Foundation, New Delhi. Shashwat Tiwari is a political science and international affairs graduate, with experience of conducting research on West Asia and Energy Issues. Prior to, joining Oval Observer Foundation he was working for the National Maritime Foundation, New Delhi as a Research Associate for West Asia maritime issues and Energy Security. He has done his Master’s in Diplomacy, Law, Business from Jindal School of International Affairs (JSIA) and has done his graduation in Political Science and Economics from University of Allahabad. He has been published previously by WorldFocus and chapters pertaining to West Asia for scholarly books published by the National Maritime Foundation.